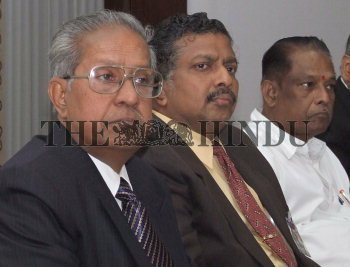 Caption : TIRUCHI: FOR DAILY: CAPTION:From left: S. Vittal, professor, Dr. M. G. R. Medical University, R. M. Natarajan, Dean, K. A. P. Viswanatham Government Medical College, and V. Jayapal, Chairman, GVN Hospitals, at the inauguration of 'Prof. R. Sarat Chandra Endowment CME 2007,' organised by the Association of Surgeons of India, Trichy Chapter, in Tiruchi on March 25, 2007. Photo:R_Ashok.